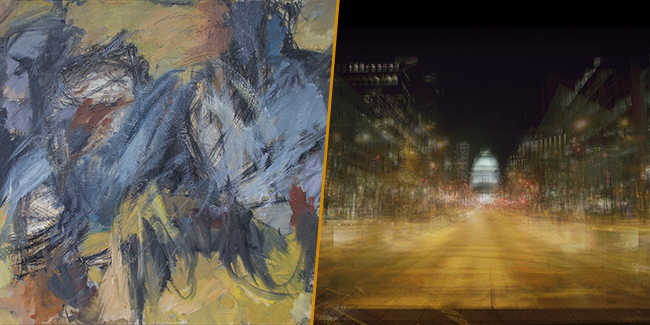 Hall and Contreras are both painters who create compositions that embody a moment or feeling. Influenced by imagery from many cultures, Contreras uses paint and rich collaged patterns to create figures and the environments they reside in. Through the medium of oil paint, Hall uses the natural world to explore color, light, form, energy and emotion. 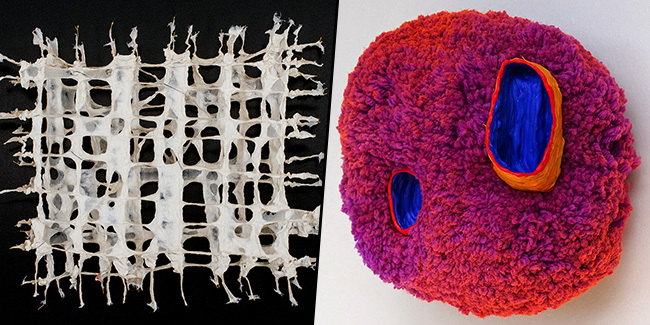 Bennett and Cordes push the boundaries of the materials they use. Bennett is inspired by nature, using paper pulp, textiles, embroidery and found objects as sculptural mediums to express her ideas. Cordes creates intuitively, assembling dynamic sculptures with contrasting colors and materials. 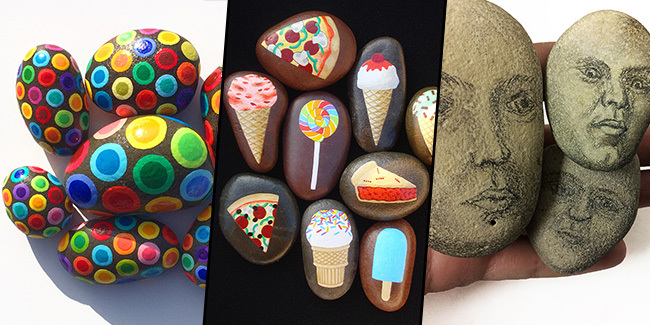 Stone-painting has increased in popularity, driven by social media and the “Kindness Rocks” movement. Adults and children paint stones and leave them in public spaces to be discovered by strangers, with the goal of spreading friendship and a sense of community. Visitors are invited to leave and find painted stones within Overture Center for the duration of the exhibit. Painted Stone Exchange – Hide and Find! Bring your own painted stones to trade in Gallery III during the reception on FRI, JAN 11. Visitors are also invited to leave and find painted stones within Overture Center for the duration of the exhibit. If you find a stone, take a picture and post with the tag #OvertureRocks on Facebook (OvertureGalleries) or Instagram (OvertureGalleries). This event is full to capacity and cannot accommodate any more people. Drop in for a stone painting workshop led by Laurel Fletcher. Workshop is free and open to the public. Stones and paint will be provided while supplies last. 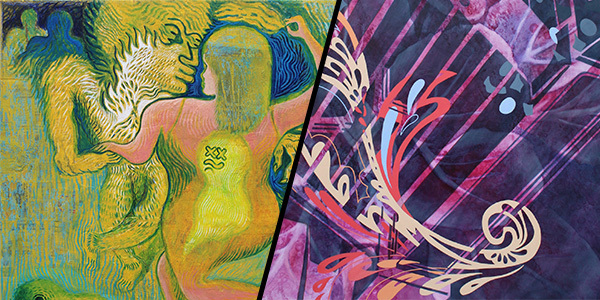 Gallery I, II and III are sponsored by the Arts Access Fund, a component fund of the Madison Community Foundation and by contributions to Overture Center for the Arts. The Veteran Print Project matches veterans with printmakers who artistically interpret their experiences and perspectives. The exhibit seeks to encourage reconnection between veteran and civilian and to grow a more honest understanding of the shared human experience. 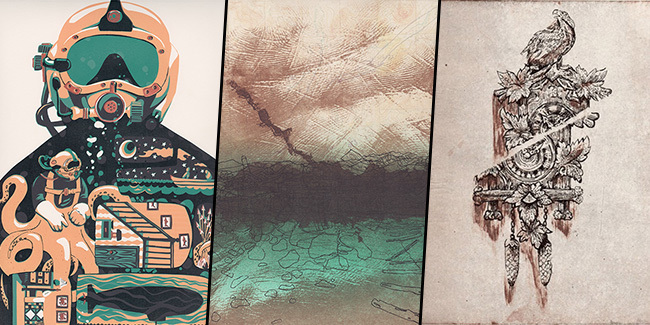 The Veteran Print Project: Transience of Narrative and Ajax are featured programs of In Good Company, a month-long exposition of emerging veteran artists and civilian collaborations. Overture Playhouse Gallery is sponsored by Norman Berven & Barbara Mittelstaedt Berven, The Arts Access Fund, a component fund of the Madison Community Foundation and by contributions to Overture Center for the Arts. This exhibition considers memories, both static and fluid. Ralser’s photographs show us the beauty and abstraction in ice. 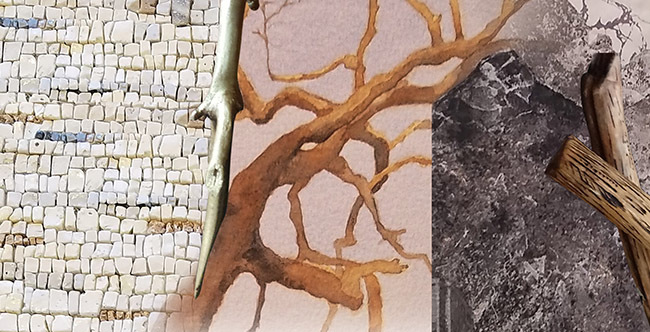 Messinides explores the fragility of memory through collage using natural materials. Blanchard exposes patterns in strata of stone. Robinson and Newman both deal with the confusion of everyday life. Robinson’s portraits contemplate the lack of perceived reason behind existence through his rough handling of the figure on the canvas. Newman imagines current social issues in the context of the fictional worlds he creates with his drawings on paper. Gallery I, II and III sponsored by the Arts Access Fund, a component fund of the Madison Community Foundation and by contributions to Overture Center for the Arts. 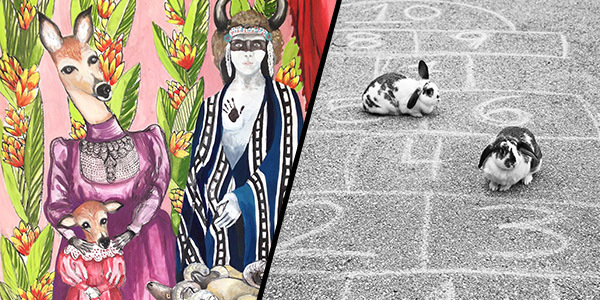 Join us for a Playhouse Gallery Reception FRI, SEP 28 from 6 PM – 8 PM! 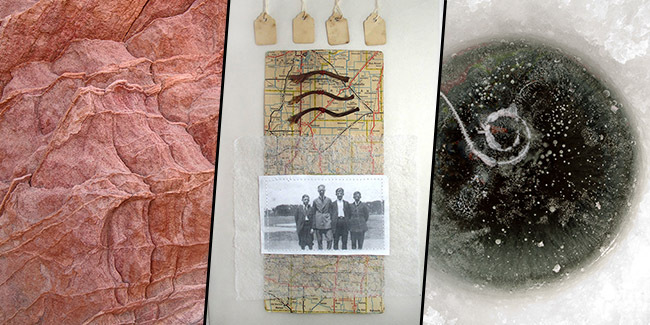 Hosted by the Farley Center for Peace, Justice and Sustainability, sixteen local artists use natural and organic materials to celebrate our connection with the Earth. Sanctuary is a photographic tour of art installations created on their wooded land near Verona, WI in Fall 2017. Overture Playhouse Gallery is sponsored by Norman Berven & Barbara Mittelstaedt Berven, The Arts Access Fund, a component fund of the Madison Community Foundation, and by contributions to Overture Center for the Arts. 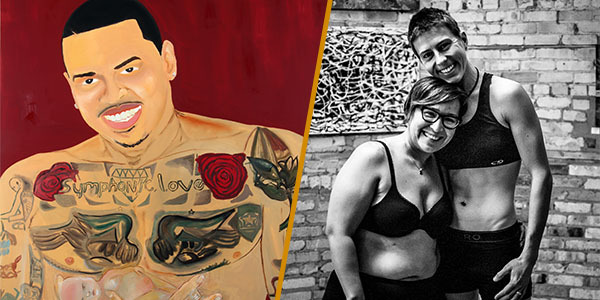 We celebrated the rich roots of Latino art in culture at the fifth annual Latino Art Fair, organized and sponsored by the Latino Chamber of Commerce of Dane County in partnership with Overture Center. 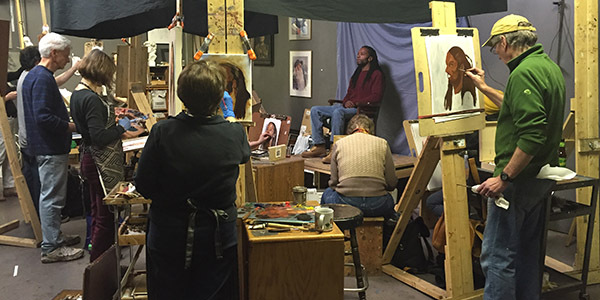 Talented artists from throughout South Central Wisconsin exhibit and sell their artwork, including paintings, photography, pottery, jewelry, music and more. This year we featured the art of spoken word and an Afro-Peruvian performance by Golpe Tierra! 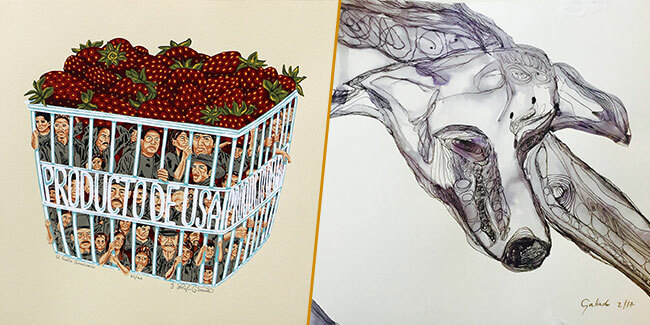 Synapses is a group of Latinx artists collaborating on projects focused on social justice to impact the community. Bethel & Reynolds repurpose, rebuild, and reimagine materials to create 3-dimensional works that blend nature, history and technology. Bethel’s sculptures and installations explore the occasionally absurd metaphors that shape our experience of time. 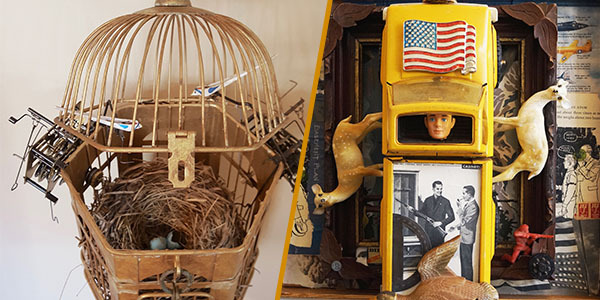 Through assemblage, Reynolds ponders the power of seemingly disparate objects to speak to memory and loss. Gallery I sponsored by the Arts Access Fund, a component fund of the Madison Community Foundation, Webcrafters-Frautschi Foundation and by contributions to Overture Center for the Arts. 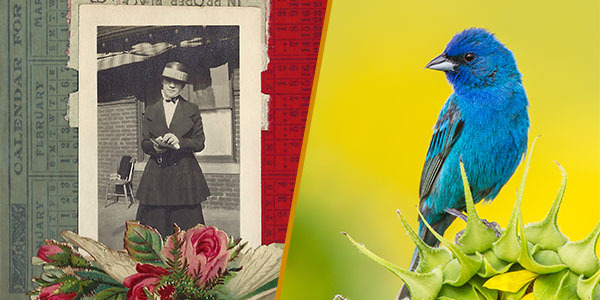 Beckman culls historical ephemera to create delicate collages that evoke memory and mystery, with women and birds recurring in her narratives. Gopalan highlights the beauty and elusive behaviors of birds around the world in his striking photographs. Gallery II sponsored by the Arts Access Fund, a component fund of the Madison Community Foundation and by contributions to Overture Center for the Arts. This exhibition investigates beauty as a cultural construct through imagery of the body. Hauer uses photography to capture unfiltered images and challenge contemporary perceptions. Wasikhongo reveals the anatomy and strength of the human body through paintings of professional bodybuilders. Gallery III sponsored by the Arts Access Fund, a component fund of the Madison Community Foundation and by contributions to Overture Center for the Arts. 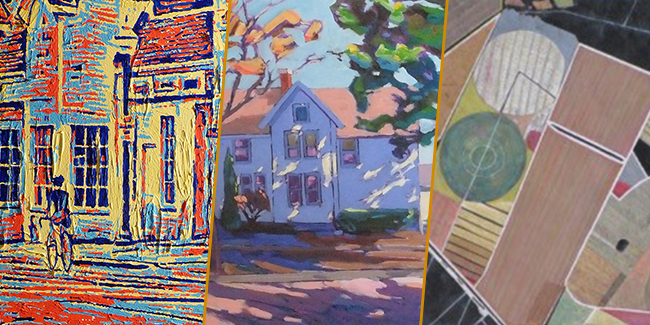 Join us for a Playhouse Gallery Reception SUN, JUL 8 from 3 PM – 6 PM! Four artists reflect on their personal laments, celebrations and yearnings through their artmaking. Along the way, they invite others into the process. How do we find peace in a world of violence? Forgiveness in a world of offense? Unity in a world of division and protest? This is not an exhibition of answers or strategies, but one of journey. There are more questions along it’s paths, the clues come more in whispers and sighs rather than shouts and epithets. Join us for a Playhouse Gallery Reception WED, JUN 13 from 6 PM – 8 PM! The 1960s was a complex and contentious era of expanding consciousness and social upheaval that profoundly changed our nation. These 33 artists explore the era and its reverberations in our current time. Overture Playhouse Gallery is sponsored by Norman Berven & Barbara Mittelstaedt Berven, The Arts Access Fund, a component fund of the Madison Community Foundation, Webcrafters-Frautschi Foundation and by contributions to Overture Center for the Arts. Water. It sustains us, cleanses us and quenches our thirst. In the not-too-distant past, clean water was considered an endless resource. Recent developments from the Flint water crisis to pipeline protests are raising concerns about access to and quality of water, for current and future generations. This exhibition explores cultural dualities and divides through a contemporary lens. Herrera’s ethereal black and white photographs express her duality as a Mexican American. The intricate weavings of Mace re-contextualize traditional Diné (Navajo) practices, while creating a dialogue on cultural appropriation. Dexheimer’s expressive paintings chronicle recent conflicts between police & the public. In this social project, Borealis interviews trans and nonbinary peers about gender and creates performances, installations and events around pressing themes. The exhibited collection of transcripts, photographs and other artifacts represents collaborating artists’ metaphors for being queer today. Étude is French for a study. In music, an etude is a composition that emphasizes a certain technique. It compels a musician to focus on and become skilled in this technique. Over time, étude work provides the musician with intense technical practice—and in time, mastery—in selected areas, opening themselves up to the possibilities of full creativity with their chosen instrument. 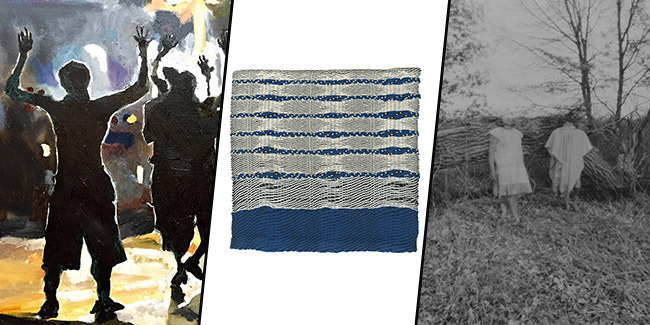 Madison Contemporary Fiber Artists (MCFA) members created fiber art that visually expresses their use of études—studies—significant to them. Their studies are the basis for this intriguing exhibit. The artists pushed the envelope of their technical expertise and expanded the possibilities for their creative endeavors. While the art is personal in nature, you will be engaged by the unexpected work that resulted from these études. 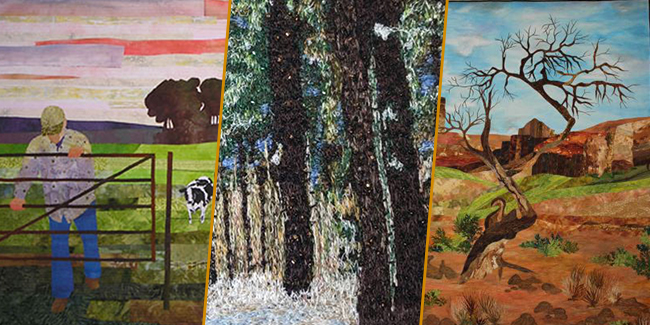 The resulting images and themes impacted the artists’ lives while at the same time improved the fiber artists’ virtuosity in their chosen mediums. 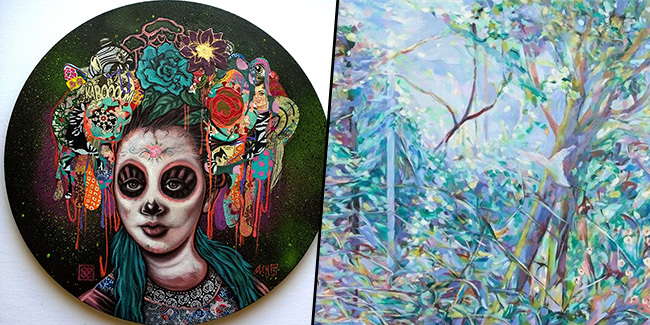 These artists reveal the tension and tranquility within our environment. Abbott depicts city scenes through a pixilated lens, hinting at tension between technology & humanity. Bauer engages the viewers with expressive compositions inspired by light, color and the builder’s craft. Cubr’s compositions suggest potential harmonies where humans and nature interact. 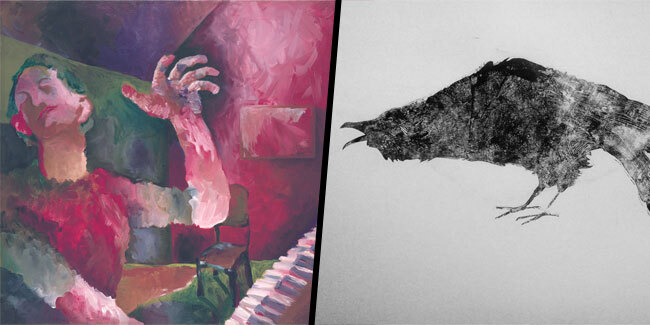 Through different media these artists each explore memory and interpretation. Gregson uses gestural line and dynamic compositions to interpret everyday objects and imagery. 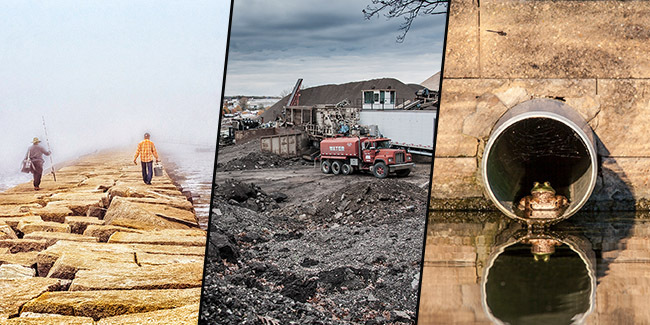 Strait layers photographs of iconic Madison sites to visually illustrate how our minds build memories of physical space. Gregson: Oil, mixed media on canvas. This Cool Science Images exhibition accompanies the Forward Theater performance of Marjorie Prime. The University of Wisconsin–Madison’s annual Cool Science Image Contest celebrates the beautiful and informative images captured by the university’s faculty, staff and students during their research. The Cool Science Images Contest features science-themed pictures created using powerful and exotic equipment — such as microscopes that can see inside living cells and satellites observing Earth from 20,000 miles away — and homemade tools as simple as a pinhole camera. The images in this exhibit are drawn from winners chosen during the contest’s first seven years, in which hundreds of researchers submitted images of animals, minerals, vegetables, clouds and stars that reveal at scales enormous and miniscule surprising patterns and features that help us better understand the world around us. The Cool Science Images project is Sponsored by Fitchburg-based Promega Corp., with additional support from DoIT Digital Publishing and Printing Services and the UW–Madison Arts Institute. George H. Hutson and Nancy Hutson artworks exemplify the father and daughter’s playful explorations. Mr. Hutson brings child-like exuberance to his paintings of fanciful dinosaur adventures. 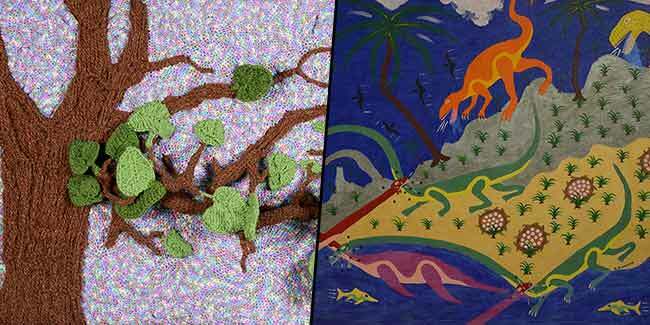 Ms. Hutson expands the boundaries of crochet with her tapestries of landscapes, skies and spaceships. Playhouse Gallery is sponsored by Madison Community Foundation and by contributions to Overture Center for the Arts. The abstract works in this exhibition playfully blend reality and dreamlike imagery to create seemingly familiar yet unexplainable forms. Daily-Birnbaum relies on personal experiences to invoke images of interest and intrigue. Brown’s structures morph modern tools and imagery into delicate, otherworldly constructions. Photography captures reality, yet through unique perspectives it can also transform the ordinary into the unfamiliar. Girard’s images encourage an appreciation of the vividness in the visual world. Kratchman’s black and white photograms beautifully capture the essence of soap bubbles through new perspectives. Through painting Coberly and Morales reveal the complexity of contemporary structures, both physical and ideological. Coberly’s architectural abstractions create tapestries of industry and modern city life. Morales reveals the duality of violence and consumerism embedded in materialistic society. Our world is made up of curves, appearing in nature, architecture, and on the body. The artists explore the subtle ways in which curves animate the aesthetics of our daily lives. They capture their findings through an older form of photography hence the Classical title, Aisthetikos Cuvare. 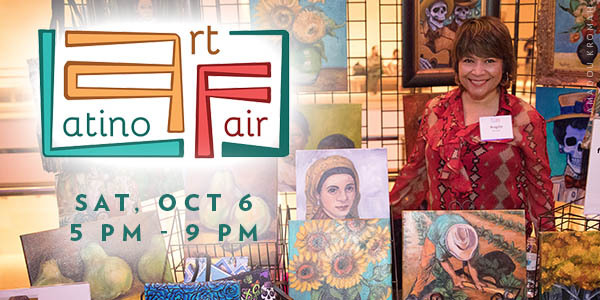 This exhibition is in conjunction with the Latino Art Fair FRI, OCT 6, 5 – 9 PM. After enjoying the exhibition & fair head to Capitol Theater for a ticketed performance by La Santa Cecilia at 7:30 PM! As a seventh-generation Texan and Mexican-American, Garcia’s ancestral connection to Texas land has led her to consider the ethical impact on her Tejano culture. Through the lense of her biracial heritage, Garcia aims to shed light on contemporary issues that current and future undocumented Latinxs face — such as harsh working conditions, the separation of families, and death while crossing the Mexico-U.S. border. 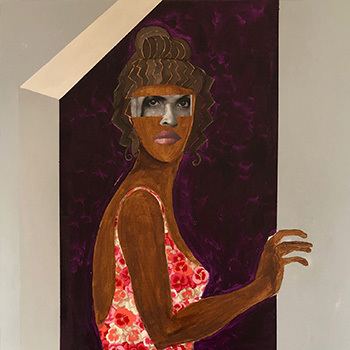 Evelyn Galindo is a Salvadoran artist living on the 89’ Meridian West, the geographic line connecting San Salvador, El Salvador and Madison, Wisconsin. Galindo migrated to Madison in the 1980’s as part of the diaspora of the most recent war and made her home in Wisconsin ever since. One key symbol that she explores in her work is the image of the nomad or stray. This is a visual way of rethinking how people navigate space and build communities when more traditional understandings of “home” are interrupted or fall short. This consideration of “home” speaks to immigrants, but also to the many who are uprooted at different times because of many personal reasons such as homelessness, divorce, job loss or poverty. Impressions reflect a method for creating woodcuts, as well as the feelings evoked while viewing art. Expressions refer to a particular style of painting, as well as to reactions elicited in the viewer. Constant explores change as represented by the ever evolving sky. Each piece is treated as a single window pane, placed into a group to form a larger window representing the evolution of changes over time and the choices they allot us. The project began with nephology and continues with different aspects of the hydrologic cycle, representing change and interconnection of all life on the planet. Captured is a series of images taken of youth inside the Dane County Juvenile Detention Center in Madison, Wisconsin. 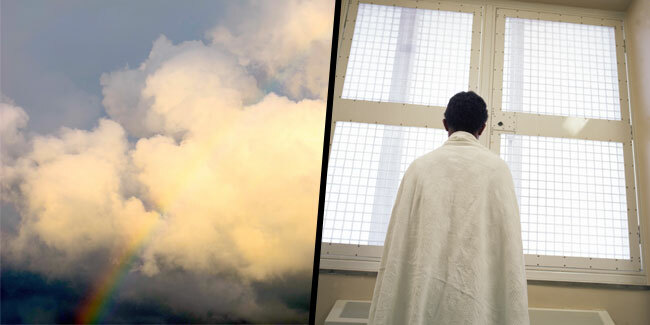 Captured hopes to expose the general community to what life is like for incarcerated youth, while at the same time creating a visual narrative that documents and puts a face to what racial disparity looks like in present-day Dane County. 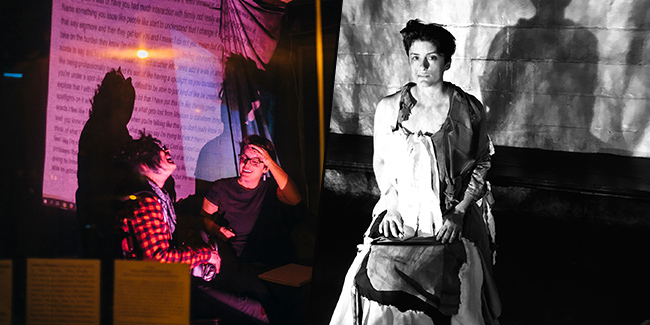 Captured is made possible by GSAFE, and is funded in part by grants from Dane Arts and the Madison Arts Commission, with additional funds from the Wisconsin Arts Board. Special thanks to Megan’s Custom Framing for donating artwork framing. 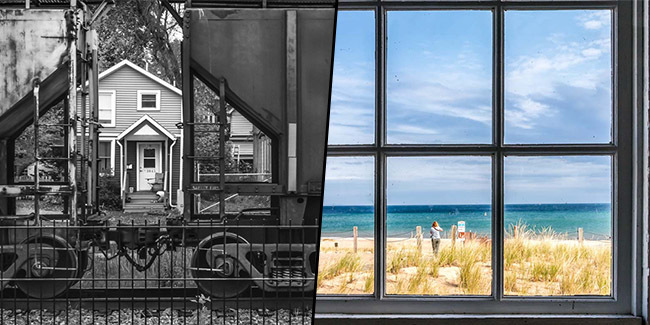 Three local photographers explore natural and constructed landscapes of Wisconsin, from the Madison isthmus to the state’s rural outskirts. Each artist has a unique style, yet their work shares a common visual preoccupation with quiet, elemental compositions. Justin Eccles and Lauren Harlowe interpret the residue of everyday imagery hidden in our unconscious memory. 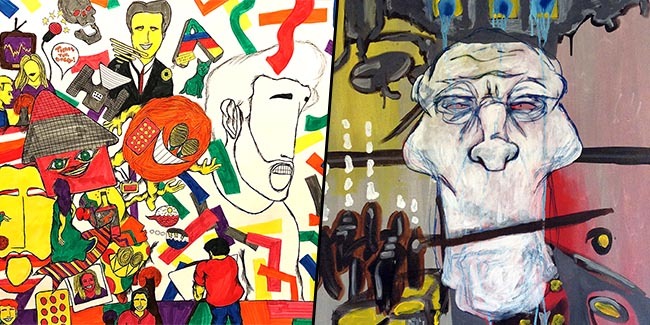 Eccles’ mixed media works entangle illustrations and abstract shapes. Harlowe’s paintings stretch, turn and shift simple designs into complex patterns. Anne and Tim Connor & Rebecca Kautz explore aspects of rural life through representations of domesticated animals. 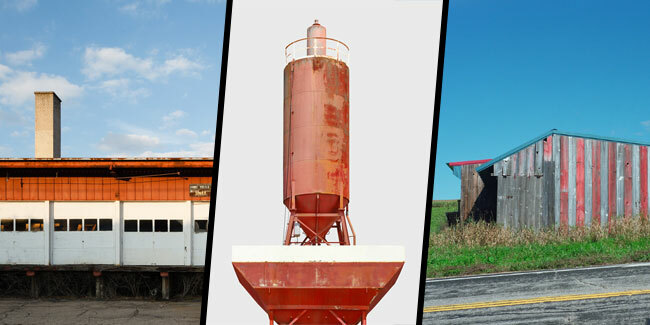 The Connors’ photographic series reveals the beauty and humor of farm life. 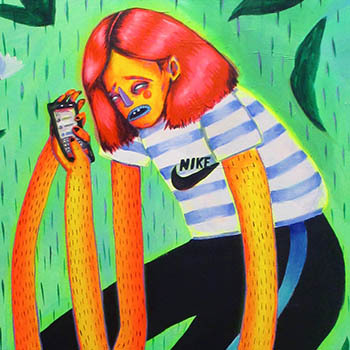 Kautz’ whimsical paintings draw on regional folklore to illustrate the human condition. Alyssa Ackerman and DarRen Morris use portraiture to reveal the countless emotions of humanity. Ackerman utilizes nontraditional and craft materials to examine human vulnerability and isolation. As a former gang member, Morris paints from the wounds of his life in hopes of inspiring young people to better versions of themselves. Art is his sanity during incarceration. Join guest speakers Judy Adrian and Neil Heinen with students from Edgewood College in a discussion about this exhibit, TUE APR 4, 2:30-3:00 PM. These portraits honor and humanize the people impacted by Wisconsin’s flawed criminal justice system. 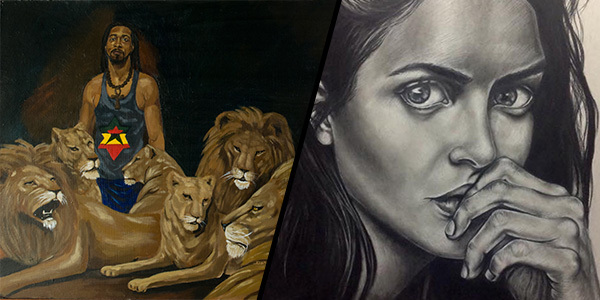 Artists of the Atwood Atelier and project creator Pat Dillon collaborate in these stories and portraits painted from life. Faces of Incarceration aims to contribute to current conversations about race, justice, and inequity.